A couple formed by Gemini and Pisces has very low levels of compatibility. But before checking the compatibility, learn a bit more about each of these signs. The elements are an important factor for the couple of Gemini and Pisces and their compatibility. Gemini is really very difficult. Pisces is a sign of Water and its relationship with Gemini lacks depth. Gemini is from the Air element. Air and Water are incompatible elements. Pisces is characterized by having deep and true feelings, while Gemini is extremely superficial. This striking difference between the two means that there is a great chasm. 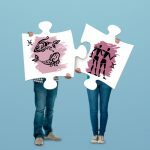 Gemini and Pisces Compatibility: how will the relationship work? Gemini is a very unstable sign when it comes to expressing its emotions and feelings to others, while Pisces, although their nature is of a changeable sign, has deep feelings and their compassion with others has no limits. Pisces delivery is unconditional. This is a big difference in the relation of Pisces and Gemini. The most important thing for Gemini is their physical appearance, while for Pisces their spirituality is above appearances. However, in addition to the contrast with these differences that Gemini has a lot of friends. Pisces is also very sociable and is a close friend and faithful companion. Pisces is characterized by imprecise communication. He shows a permanent evasion through his words. Gemini deals with communication fluency to express himself intellectually and is quite eloquent. This couple has a great difficulty in communication with one another. An important factor is that both deal with different concepts, and this is seen in their conversations. Gemini need to learn to control their justified lies, this makes their personality full of falsehoods. Pisces is an authentic sign with a personality that does not support deception. The Gemini and Pisces couple will face great conflicts if they want to be together. In intimacy Gemini and Pisces will also face big difficulties. Gemini are inconstant in their sexual partners, their delivery will always depend on permanent changes in the relationship. Pisces is a dreamer and very dedicated in any relationship. The Gemini partner personality will cause Pisces to experience a major disappointment because they feel they cannot find emotional stability in their Gemini partner. This couple could get to have a great friendship if their relationship fails. Learning to respect the character of each sign is a great lesson.